Subway cars inside Talgo facility. Photo by Graham Kilmer. Many will remember when the last train from Talgo, the international train manufacturer based in Spain, left town as the company closed its shop in central city Milwaukee. Well, the company has now returned to its old facility at 3533 N. 27th St, in the Century City Business Park, formerly the site of A.O Smith, and last week held a grand reopening of sorts, with city officials there to celebrate. While Talgo specializes in manufacturing high-speed and transit trains around the world, the plant will handle the repair and maintenance of trains, at least for now. The facility will also has the capacity to manufacture trains, and will be the first production facility for Talgo in the US. They also have a maintenance facility in Seattle, Washington. The reopened Talgo facility and its production capacity gives the company a stronger foothold in the U.S. market. 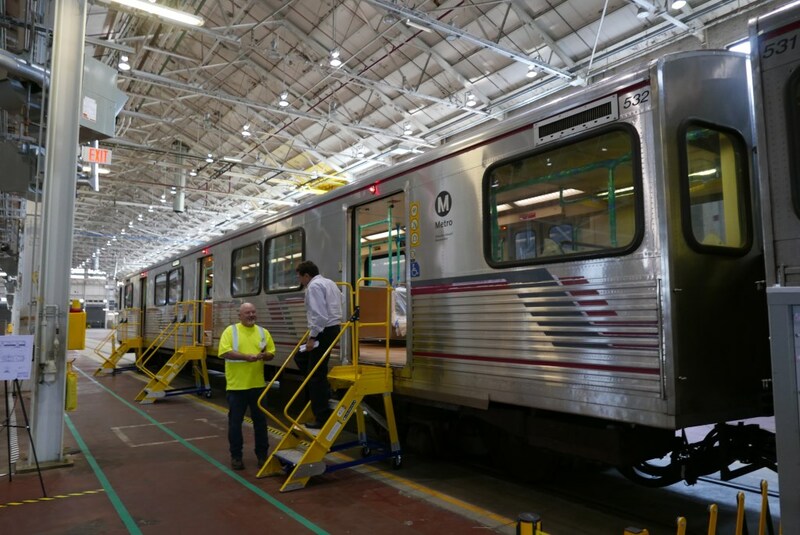 It recently secured a contract with The Los Angeles County Metropolitan Transportation Authority to repair subway cars. For Milwaukee officials, it was an opportunity to bring jobs to a long blighted part of the city. For the next 56 months Tango employees here will work to fulfill the Los Angeles contract, which is worth $72.9 million. Perez said the company estimates that the yearly market for the kind of work they are doing at the Milwaukee plant is more than $180 million. Theoretically, if Talgo is awarded more contracts, the facility in Milwaukee will grow and bring on more employees. “This is a good start,” said the local Ald. Khalif Rainey, hoping the plant will continue to grow and hire more employees from his district. Rainey added that he hopes having an international firm like Talgo in his district will send the message to other corporations that there is a “ready and willing” workforce, as Mayor Tom Barrett put it, in central Milwaukee. “We can actually have a work, live, play model right here in a, hopefully, soon-to-be-formerly distressed neighborhood,” Rainey said. Perez concurred. Along with the location being logistically promising, he said the available “skilled workforce” was an important part of the deal. Barrett said the city was “very pleased to welcome Talgo back to the community,” — especially after Gov. Scott Walker rejected the high-speed rail project, for which Talgo would have supplied the trains. And after Republican legislators decided not to honor a contract with the manufacturer for new trains on the Hiawatha line between Milwaukee and Chicago. Taxpayers ultimately footed the bill on a settlement with Talgo that cost millions more than the original contract was worth. The Milwaukee Streetcar construction along St. Paul Avenue is in the "most advanced stage" according to construction officials, as crews poured the first concrete along the line setting the rails Wednesday. "We're on schedule, spring work can present challenges because you get all types of weather in spring,” said Construction Manager Carolynn Gellings. “All of this work is very weather dependent." In Detroit last weekend the city opened the "Q-Line," a system largely designed by the same company and uses the same vehicles from Brookfield Equipment Corporation as the Milwaukee line does. TODAY'S TMJ4 sister station WXYZ-Detroit reports a few hiccups with the launch. Long wait times, mechanical problems, and a car having to be towed from the tracks were reported. office at 1001 W. St. Paul Ave. The steel is expected to be fully delivered by the end of the month. segment of the street out and installing the steel rails and new concrete. Construction on the streetcar system is being led by Kiewet Infrastructure. working at a number of spots along the route. begin in the fourth quarter of 2018 following route testing. milwaukee dot com" site reports. Utility relocation already is underway. Union, IL - A giant piece of Chicago history is coming back to life at the Illinois Railway Museum in Union, McHenry County. 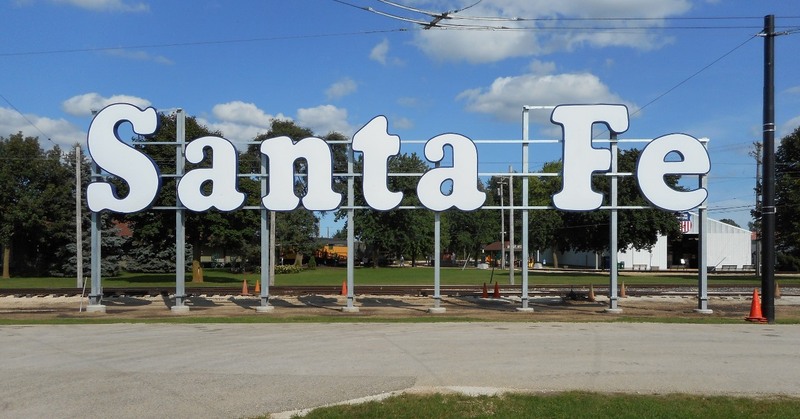 On October 29, 2016 at 5:00pm the 70-foot long illuminated SANTA FE sign which for decades sat atop the Railway Exchange Building at 224 South Michigan Avenue in downtown Chicago will be re-lit following an extensive restoration effort. The sign was acquired by the museum in 2012, when it was removed from the building and donated by the building's owners, Hamilton Partners. 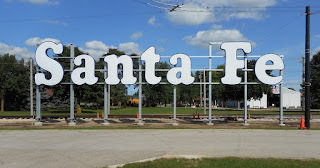 Restoration of the sign, which was constructed in 1982 to replace an earlier 1962 version, took place in 2016 courtesy of a grant from the BNSF Foundation. Restoration of the enormous sign was conducted by MK Signs Chicago. "Over 260 man-hours went into this project," said Dave Diamond, head of the museum's Buildings & Grounds Department. "The work included cleaning and repairing polycarbonate surfaces, wiring replacement, and installation of over 1400 energy-efficient LED modules to illuminate the letters." Steel supports were installed near the museum entrance, where the SANTA FE letters will be easily visible from passing cars. The sign joins other restored railroad signs at the museum including examples from the North Shore Line, South Shore Line, Illinois Central Railroad, and Chicago Transit Authority.